90% of these tumors are benign. These tumors occur elsewhere in the body and are called paragangliomas. In most cases, pheochromocytoma has no known cause. In others, it is caused by a genetic mutation. The tumor will be removed whether it is cancerous or not. This procedure uses small incisions and special instruments. 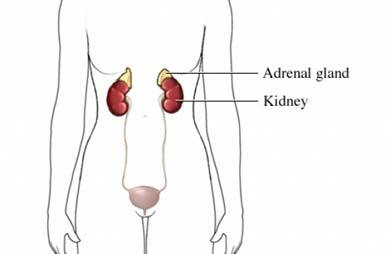 Sometimes, the adrenal glands are removed as a part of this process. Prior to surgery, high blood pressure will need to be brought under control using blood pressure lowering medications. Chemotherapy may be used if the tumor is cancerous and has spread outside of the adrenal glands. Radiation therapy may also be used to help destroy the tumors if they have spread. There are no current guidelines to prevent pheochromocytoma. Pheochromocytoma. National Organization of Rare Disorders website. Available at: https://rarediseases.org/rare-diseases/pheochromocytoma/. Published 2008. Accessed August 24, 2017. Pheochromocytoma (adrenaline-producing adrenal tumor). The American Association of Endocrine Surgeons website. Available at: http://endocrinediseases.org/adrenal/pheochromocytoma.shtml. Accessed August 24, 2017. Pheochromocytoma and paraganglioma. EBSCO DynaMed Plus website. Available at: https://www.dynamed.com/topics/dmp~AN~T114874/Pheochromocytoma-and-paraganglioma . Updated September 6, 2016. Accessed August 24, 2017. Pheochromocytoma and Paraganglioma Treatment (PDQ®)–Patient Version. National Cancer Institute website. Available at: https://www.cancer.gov/types/pheochromocytoma/patient/pheochromocytoma-treatment-pdq. Updated August 18, 2017 Accessed August 24, 2017.